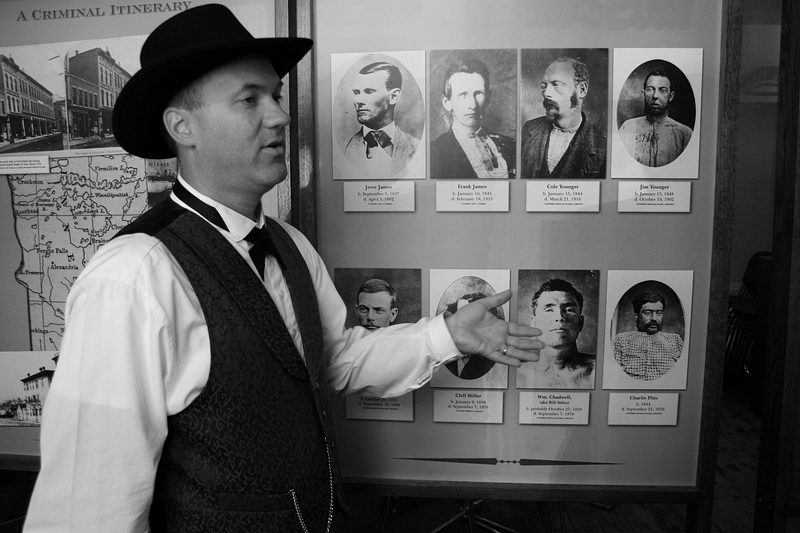 Christian Hakala talks about gang members involved in the Northfield bank raid, pictured to his left: Frank and Jesse James; Cole, Bob and Jim Younger; Clell Miller; William Chadwell; and Charlie Pitts. Minnesota Prairie Roots file photo 2012. To say folks in Northfield, Minnesota, appreciate local history would be an understatement. Take Christian Hakala. He has a Master of Arts in history, has taught history, has served as Northfield Historical Society Board president and volunteers as a tour guide. During his day job, he’s Director of Individual Giving at Northfield’s Carleton College. It was in his capacity of NHS tour guide that I met Hakala in September 2012 as he walked visitors through the “Attempted Bank Raid” exhibit. That would be the September 7, 1876, attempted robbery of the First National Bank of Northfield by the James-Younger Gang. A bank cashier, a Swedish immigrant and two of the outlaws died in seven minutes as townspeople fought back. Northfield this week is celebrating the heroism of locals during the annual The Defeat of Jesse James Days, an event which is among Minnesota’s most popular community celebrations. DJJD includes bank raid re-enactments. Hakala has participated in those, too, role-playing a townsperson. If you appreciate history and drama and community celebrations, then head on over to Northfield this weekend. This beautiful historic river city knows how to showcase local history in a big way. FYI: Click here for more details about The Defeat of Jesse James Days. Thanks so much for sharing Christian Hakala with us. How wonderful to see a man who loves his history and his community this much. You are welcome. And I agree about Christian. He’s not even a Northfield native. Very interesting. Man those outlaws really got around. I believe the failed robbery in Northfield ended their career. Hmm, the James Gang buried much of their loot in areas just south and west of here. Some has been discovered, but it’s been said there is still much treasure to be found. I love the re-enactments. If they’re well put together they give me goosebumps and a real appreciation of the times. I would have made a terrible outlaw, and probably even worse lawman! Ha ha! What a great post… and Christian Hakala is one of those rare people who makes history interesting AND fun! I have yet to see the re-enactment in Northfield. But it’s extremely popular and, I’ve heard, well done. Wasn’t it because they were trying to rob two banks at the same time that caused things to go haywire? Nope. One bank. The townspeople fought back.